Thaw the 2 packs of 200g Garfish overnight in the refrigerator or put the packs in cold water until thawed. In a small bowl, mix the olive oil, vinegar and mustard. Place the zucchini on a chopping board. Using a vegetable peeler, shave the zucchini into ribbons. Add the zucchini to a large serving bowl with the mint, cherry tomatoes, radish and feta. Add the prepared dressing, and toss to combine. In a large bowl, mix the flour, cornflour, salt and peppers. Add the garfish fillets, and toss to coat the fish. Place a medium saucepan (approximately 18cm diameter) onto the stovetop, and half fill with cooking oil. Turn the heat to medium, and heat for a few minutes. To test if the oil is ready for frying, add one garfish fillet to the oil. The garfish should become golden within 1 minute. Once the oil is ready, carefully place a few pieces of floured garfish into the oil and cook for 1 minute. Remove the garfish from the oil and place onto paper towel to drain. Repeat until all of the garfish has been cooked. 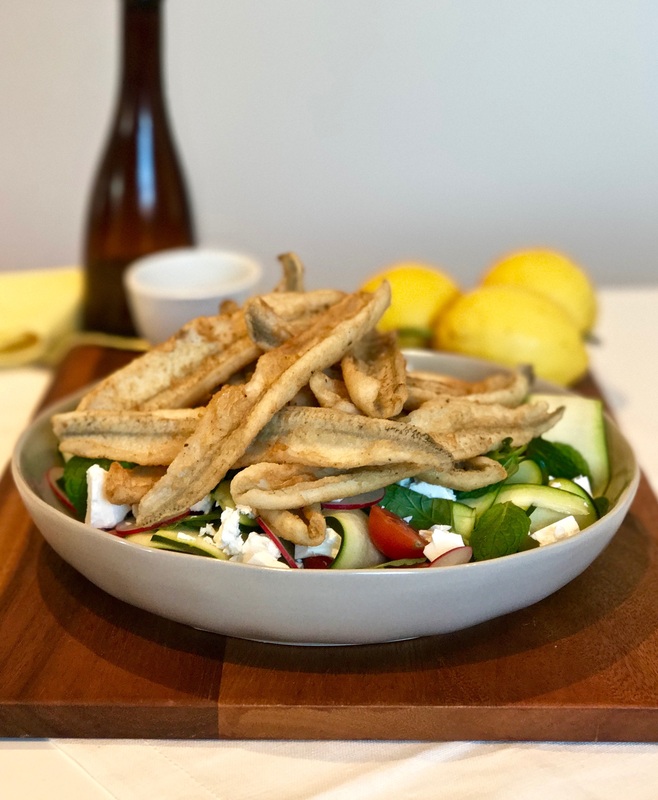 Place the garfish on top of the salad to serve.